I created this card for my Mom's birthday, this is one of my absolute favourite floral images. While I'm sure there is a traditional way to colour dahlias, I typically let my imagination take flight and colour with what calls to me. 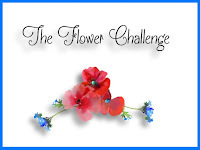 This is also my first time joining the Flower Challenge as well as the Cards Galore Encore Challenge. Check out their links below and I hope you'll play along! To begin, I prepped a piece of Strathmore 140lb coldpress watercolour paper with my powder tool and used VersaMark ink to stamp the beautiful Dahlia image from Wplus9 "Beautiful Bouquets" and heat embossed it with white detail embossing powder. I then used my Zig Clean Color Real Brush Markers to add a tiny bit of colour where I wanted the petal or the leaf to be the darkest and used my Prisma waterbrush to pull the colour out. After all the petals and leaves where done, I traced around the lower right side of each area with my light grey and pulled that out to create a shadow. The greeting from CTMH's "Sending Smiles" is heat embossed with detail silver powder. I used some super sticky two way tape to adhere the watercolour paper to a piece of coordinating patterned paper and then put the entire piece on a standard A2 sized card base. Such a gorgeous, delicate card! I love the embossed stamp and the watercolour palette you chose. 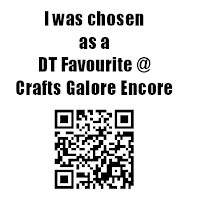 Thank you for sharing your project with us at the Crafts Galore Encore August Challenge, “Anything Goes”. Good Luck and hope to see you again next month!